It is early evening in late May as my husband and I roll off the ferry at Nanaimo and head north under a clear blue sky to the Village of Cumberland on Vancouver Island. Alongside the highway grow streams of golden broom and purple lupin that light up the earthy tones of the Comox Valley landscape. We are on our way to attend the official commemoration of Cumberland’s Japanese Cemetery as a historical landmark. My grandfather, Kichiso Sora, is among the approximately 198 Japanese people buried there, most of them loyal and hard workers in the teeming coal mining industry that drove the local economy from the late 1800s. 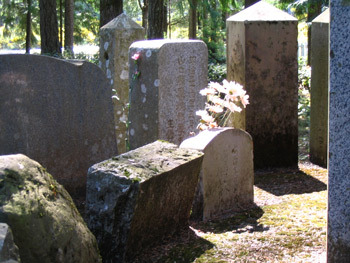 Sadly, anti-Japanese sentiment during WWII led to the desecration of not only this cemetery, but several others on Vancouver Island; a desecration that led to the displacement or disappearance of many headstones and markers. As a result, my husband and I can’t find my grandfather’s grave. But that hardly matters because, for me, the importance of this journey and the commemoration lay in the opportunity to remember, and thank, my grandfather’s generation. As one of Kichiso’s 18 Canadian-born grandchildren, and for the 20 great grandchildren subsequently born to his line, I also feel that the cemetery is the symbolic cornerstone to the survival of our heritage. 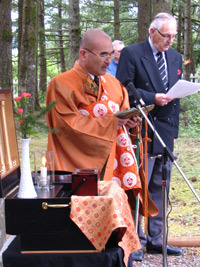 The Japanese Cemetery lay just east of the village nestled among tall evergreens on a small, gently sloping parcel of land. A few years back, my husband and I visited Cumberland and, for the most part, had to rely on our memories to locate the grounds. At the time, we found only a small weathered sign tacked to a hydro pole pointing in the direction of the “Oriental Cemetery.” On this trip, however, we are happy to find new signs on the highway that guide us directly to the “Japanese and Chinese Cemeteries,” and are just as pleased at the sight of the newly-constructed white picket fence that neatly surrounds the cemetery grounds. Based on family photographs taken in 1940, the cemetery once had such a fence, but for the past few decades nothing surrounded its perimeter, giving it the appearance of open woodland. To me, the new fence reinforces a “sense of place” and “sacredness” and brings focus to the poignant memorial that sits at the top of the cemetery. Erected in 1967, this memorial includes a number of recovered headstones on a raised pedestal and stands like a quiet altar. It’s a peaceful display in appearance, yet also a powerful tribute to those who came to this strange country, most barely aware of the culture, customs and challenge they had accepted as they embarked in starting a new life. As I pass through the simple wooden archway that opens invitingly onto the memorial, I feel a renewed reverence and a gratitude to those who have ensured that this tiny cemetery is not forgotten. Before the ceremony begins, I wander around in the shade of the cemetery grounds trying to recall what stories I’d heard about my grandfather and his life. Having never met my grandfather—he died long before I was born—I know so little about the man. 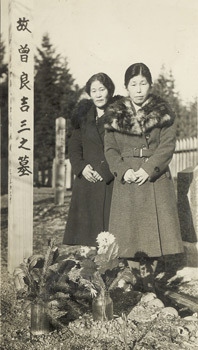 In my hands, I carry two photos from the past: one of my grandfather and another of my grandmother, Hanayo, and her sister-in-law, Ryu Sora, standing at my grandfather’s graveside in this very cemetery in 1940. I search the photo for some features to help orient me in the current landscape. Nothing looks the same, and each time I gaze up I feel myself shifting between generations as more than 60 years lay between where my grandmother once stood and where I am now standing. 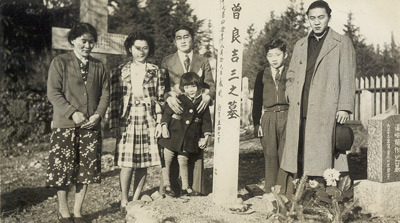 From the photo, I note how my grandfather’s burial had been marked with a tall wooden post inscribed with his name in Japanese, and how his plot was outlined on all sides with rounded boulders. I know that no sign of his burial exists today, yet I find myself half-believing that every rock that pokes through the moss might be part of the border to his plot. Not surprisingly, a little toe-tapping dispels such thoughts. However, as I meander through the cemetery on this peaceful morning, I am certain that I’ve at least passed over the spot where he lay buried. My grandfather had arrived in Canada more than 100 years ago and worked in Cumberland’s No. 5 mine. He and my grandmother raised their six children—Masaru, Kiso, Shigeki, Chizuko (my mother), Sumio, and Katie (Takako)—in a house on No. 5 Road (now known as Maple Street). No. 5 Road was home to twenty-one families, most of whom were first generation Canadians, and these families formed one of two Japanese communities in Cumberland. My mother’s stories of her early years are rich with detail of treks through the woods to Comox Lake and up to “Top Lake” to collect matsutake mushrooms, and other carefree adventures. Her tales of life there are a 16-year-old’s recollections of a happy and simple life that reflects a sense of security and a strong bond to a community built of family and close friends. I would later come to know many of these folks as I was growing up, calling so many of them “uncle” or “auntie,” unconscious and uncaring of whether they were related to me by blood. I came to appreciate how closely regarded friends were and how so many of them were woven into each other’s family. With age came a more mature and well-rounded appreciation of the importance of my heritage and its significance in Canadian history. Sadly, I never knew my grandfather or had the opportunity to have him tell me about his life directly. Yet, by listening to my mother’s stories, I see more clearly how life in Canada began for my family and how it is woven into the tapestry of stories told by countless other Canadians of Japanese descent. My patience and attentiveness to listen to my mother’s stories is long overdue. For years, I looked into my mother’s photo albums and never questioned the many faded scenes and unknown characters, so I began to ask her questions about them. As she puts names to faces and places in the photographs and recounts daily activities, of who-is-related-to-whom, the isolated photos begin to meld into each other, offering a more complete and meaningful glimpse into my mother’s childhood experiences in Cumberland. No longer are the images of “just houses” or of people as mere faces; instead, a lively community now emerges filled with family and friends, voices, laughter and activity. As I discover on this trip, the Japanese Cemetery in Cumberland gives me a sense of place to honour the roots—and strength—of my family’s journey in Canada. I see my family’s history and my own identity as intricately tied to the landscape of this country; our lives are, in fact, part of its cultural fabric. Like so many other Japanese-Canadians, the Sora family’s story in Canada forms a series of tales that is propelled by being forcibly removed in wartime from their initial settlement on the West Coast. Family and friends were scattered. My family’s tale moves across the landscape from Cumberland to internment quarters within BC and, for some of my uncles, to road camps outside the province. 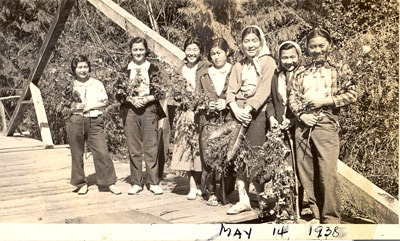 At the close of WWII, my grandmother and her six children, along with scores of other fractured families, find a way to re-unite and resettle in eastern Canada; a testament to the flexibility, adaptability and strength of my parents’ and grandparents’ generations that, in turn, instills in me a deeper sense of pride in my Japanese Canadian heritage. Tying this historic cross-country saga to its significance both to my family and to the wider community is what gives context to the commemoration and underscores its importance to me. 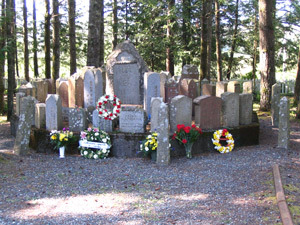 As I lay flowers on the memorial, it occurs to me that these once-displaced headstones are like a metaphor of the once scattered lives and the losses suffered by the local Japanese community at the hands of a racial intolerance born of ignorance; a community that somehow found enough resolve through the strength of will that individuals and families possessed to regroup, rebuild and eventually flourish. It drives home to me firsthand their enduring legacy, and how I, from where it all started more than 100 years ago, am proudly part of that continuing saga. Catherine Yasui is an archivist and former archaeologist who was born and raised in Toronto. She and her husband, Randy Preston, have lived in Vancouver for the past 16 years.